In a blink-and-you’ll-miss-it moment in the Legacy TV spot, which mostly just uses scenes we’ve already been shown before, there’s an intriguing shot of Iron Man and Star-Lord. It’s so quick it’s difficult to get a proper gauge on what happens, but we can tell that it’s another moment of the pair together on Titan, where they’ll be fighting Thanos, and it does appear as though Tony Stark is trying to restrain Peter Quill. 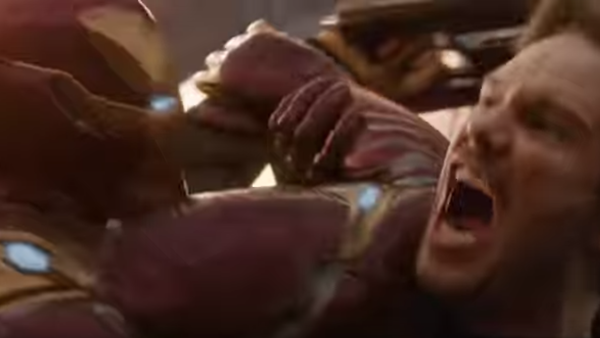 That suggests he’s trying to run into a head-on collision with the Mad Titan, so it’s a good thing Iron Man is there, but that in turn begs the question why. If Star-Lord’s emotions are getting the better of him, then does that mean something terrible happens to one of the other Guardians on Titan?